This year’s Nobel Prize for Peace went to Al Gore and the UN’s Intergovernmental Panel on Climate Change (IPCC) for their efforts to awaken the world about the risks of climate change. 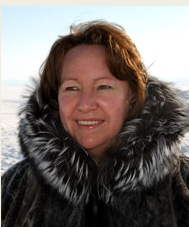 That’s great news but I’d have preferred to see the other candidate for the prize, Canadian Inuit Sheila Watt-Cloutier share the award with the IPCC not Gore. 1. Watt-Cloutier has been a passionate and eloquent communicator about the fact that indigenous people of the Arctic, and indigenous peoples elsewhere, have taken the first and hardest climate change hits so far. It would be been fairer and more representative of the reality to award the prize to an indigenous person. 2. 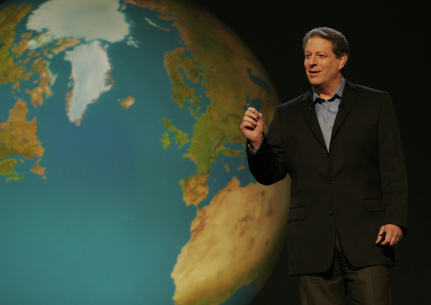 For eight long years Al Gore was second in command of the largest greenhouse gas emitting country in the world. And yet emissions climbed and climbed even though Gore knew climate change was a real and pressing emergency. When running for President Gore barely mentioned GW and then the world had to suffer thru the other GW — George W Bush and his blind and selfish intransigence. 3. Al Gore’s GW solutions are mostly wrong. Biofuels are a bad idea and only make rich agri-corporations richer. Carbon trading markets are an equally bad idea — enshrines the rich countries’ right to pollute our common atmosphere. A moratorium on coal and a carbon tax are some of his better ideas. However, Gore fails to address the root of the problem which is an economic system based on endless growth on a tiny planet with an awful lot of people. You are *such* a sore loser that it’s embarrassing for all parties involved. It’s as if The Nobel Piece Prize was a coveted piece of right wing rating bonanza. Think about it for a second, when was the last time a scuffle broke out in the audience when an expectant scientist (does that even exist?) didn’t get the nobel prize. Al Gore’s win is a great tool if only for the fact that he’s visible. Sheila Watt-Cloutier isn’t. So tough it up. You might not like the guy, but he’s got a bigger megaphone than you. So at least have the sensibility of saying “Congratulations to Al Gore. As an aside, here’s an equally deserving candidate”. God, where the f*ck has all the gentlemenliness and sportsmanship gone. It’s like we live in a world of spoiled cry babies that call each other names at every occasion. Global Warming is how Al Gore makes money. Ask him about molten Metal Technologies, too. I think you’re both right and wrong on this. I’m Canadian, so we were hoping that Sheila Watt-Cloutier would win (along with Gore), but that’s life. She’s still an important person, with or without the prize. Gore is not perfect. His solutions are not perfect. But he is on your side of things, despite his lack of performance while in the white house. The same could be said of Dion and Chretien, but why complain when we now have Harper who’s not planning to go forward with Kyoto at all? I think the point is not to join the bandwagon of criticism, but rather to be excited that GW (as you put it) is on the map now, and that’s what counts. Best of luck making your own changes too! You’re right – it’s a big problem. I do think that had Watt-Cloutier won the Nobel this year, along with the IPCC, it would have been a good boost for spotlighting where global warming will hit hard, in the polar regions of the world. Gore did not need to prize, he already got an Oscar for the movie he was the MC for, so he already had clout. Steve, you brought up a good point, which I don’t think any other reporter in the world has made. Who knows how the Nobel committees decide? But giving the prize to Ms WC this would have been a good idea. Maybe in the future, she will get the intl recognition she, and her people, deserve. it would have been nice for my great auntie won the prize.. im still proud of her, regardless.